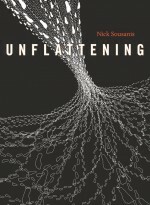 As a comic book fan and budding philosopher, I was intrigued to learn about the publication of Unflattening by Nick Sousanis – a graphic novel that claims to question the ‘primacy of words over images’ – to counteract the ‘flatness’ that pervades (Western) society and teach us ‘how to access modes of understanding beyond what we normally apprehend’. Clearly the book has some lofty aspirations, but does it live up to its own hype? The main problem I found with Unflattening is that it doesn’t quite know what it wants to be. On the one hand it’s a ‘comic’ – a graphic novel that anyone can go and buy online. It is also doctoral dissertation, something which one would hope would therefore require some degree of academic rigour. However as a piece of academic work that straddles multiple disciplines there remains the question of the extent to which Unflattening is either a graphic novel with some philosophy thrown in, or a work of philosophy presented in graphic novel form. The problem comes then at the point at which the book is received by the reader. To those who fall on the media, art and design side of the spectrum, Unflattening is undoubtedly an accomplished piece of work. The quality of the illustrations is excellent and the book makes a strong case for taking the graphic novel far more seriously as an art form. However, if you read Unflattening as a work of philosophy primarily, then the book does fall somewhat short. This is in many respects down to the limitations imposed by the medium itself, but can also be attributed to the fact that the author does not engage fully with the rather weighty works he draws upon throughout the course of the book. How you receive Unflattening then will very much depend very much on which side of the fence you fall on. As a graphic novel that offers something a little bit different, Unflattening is excellent, however from a philosophical standpoint, it is rather lacking. Maybe Nick Sousanis set the bar too high – or maybe his publishers did this for him. Either way, I don’t think even the author will agree that Unflattening is quite as deep or ground-breaking as it claims to be. There are clearly some fundamental problems here in terms of the intended audience for Unflattening. It doesn’t help that claims to teach us ‘how to access modes of understanding beyond what we normally apprehend’. It is somewhat ironic that while the book claims to challenge the primacy of words over images, the author must consistently resort to words to make his claims as images alone are rarely enough to make his case. He is also then effectively hamstrung by his chosen form in that the graphic novel simply does not allow for the levels of engagement needed when you start to throw around the names of some major philosophical heavyweights. You can’t on the one hand, make reference to Deleuze and Guattari’s A Thousand Plateaus, and then limit your engagement to the effect of saying ‘by the way, Deleuze and Guattari talked about rhizomes’. This just doesn’t cut it in the academic world, and also does a disservice to the non-academic reader who we must assume won’t be familiar with the full meaning and implications of Deleuze and Guattari’s work. The effect then is that the book neither works from an academic standpoint, nor indeed from an interested reader perspective, as the engagement is too superficial to be truly meaningful. Just what is the author trying to say? 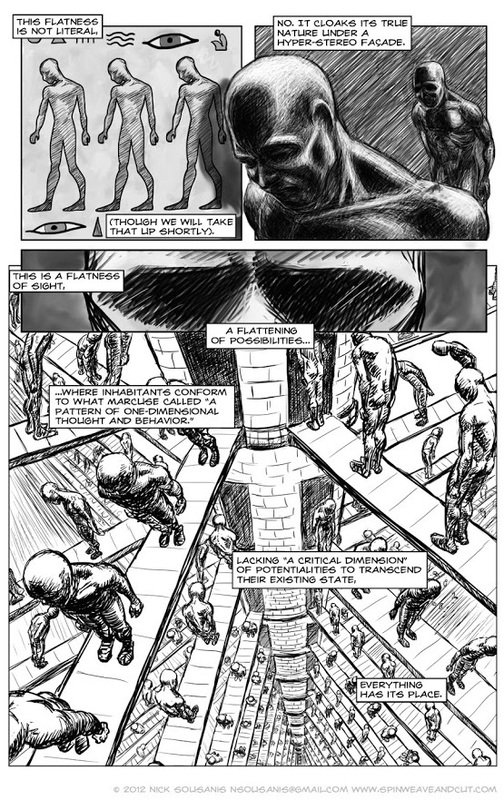 As well as the fairly major problems associated with its form, Unflattening is also littered with internal contradictions that would suggest it lacks the strength of its own convictions. We have already touched briefly on the use of images here, but it bears repeating here that the images used only very rarely work on their own. While the author is making some attempt to do away with the chains that tie us to written language, he is himself just as trapped as we are, resorting to language to make his key points – language which is supported by images, but which could equally work just as well on its own. The same is not true of the images which need the text in order to make sense. But this isn’t the only contradiction we encounter. On the one hand the author tells us we should ‘do away with hierarchies’ (58), and privilege rhizomatic structures, yet at the same time creates a work that is incredibly hierarchical in its very nature. The author criticises single modes of representation but doesn’t really engage with how these forms of representation came about – how and why language evolved to be the way it is. There is also the question of what the author is actually trying to say. What is it he is saying we are trapped in? Is it language, discourse or something else? But if images are part of the answer, aren’t they just as entrenched in discourse as other forms of communication? Just because the mode of representation changes, doesn’t necessarily mean that we are suddenly free. This would seem to be one of the central weaknesses in the author’s argument: he singularly fails to acknowledge the deep and pervasive nature of the power structures that bind us. The argument is far more complex than to just suggest that images=good, words=bad. To not even make reference to the operation of the written word seems to me, to completely miss the whole point. Though this review may well focus on many of the negative aspects of Unflattening this is not to say that it is in itself a bad book – far from it in fact. However, I think the problem more than anything is that the author has set his bar way too high. While Unflattening may be fairly ground-breaking as a graphic novel, when taken in a wider context it simply isn’t as revolutionary as it claims to be. 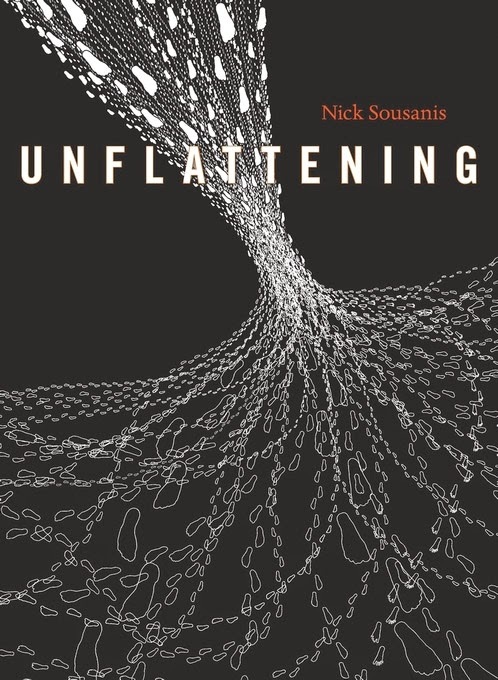 The weaknesses here are in terms of the book’s philosophical engagement, and in this sense Unflattening does a disservice both to the academic community, and the wider reading public. Yes it offers up something a bit different to the norm, and is even an enjoyable read, but dig slightly beneath the surface and you find Unflattening suffers from many of the same problems it claims to address.